Make Believe is the fifth studio album by American rock band Weezer, released on May 10, 2005 by Geffen Records. The album was considered to be a return to some of the emotionally vulnerable lyrics of Weezer's previous releases, and due to the strength of the hit single "Beverly Hills", the album was a commercial success. In addition, "Beverly Hills" also gained Weezer's first Grammy nomination for Best Rock Song. Despite this, Make Believe received mixed reviews from critics and fans, although it has remained a consistent seller. The recording process of Make Believe began prior to the release of their previous album, Maladroit; however, it was prolonged compared to the recording of most of Weezer's previous albums, and lasted for almost three years. Rivers Cuomo's songwriting on Make Believe was described as "[a] return to musical, emotional bloodletting", although the lyrics were noticeably more simplified than before. Beginning in spring 2002, and at random points in late 2002 and early 2003, demos for possible use on Weezer's fifth album would be uploaded to Weezer.com's audio/video page. After touring during the summer and returning to S.I.R. Studios for additional sessions, the band ultimately decided to start from scratch with a fresh group of songs. 28 songs in all were uploaded on the website (and can still be found on various fan sites) yet none made the actual album. This batch of songs is commonly referred to as "The A5 Demos" or "Early Album 5" amongst fans. During the recording process, Rivers Cuomo's discovery of meditation due to the influence of producer Rick Rubin was beginning to take on a greater influence on the album's content. For instance, "Pardon Me" was written after a ten-day guided meditation course in which he learned the ancient techniques of vipassana (insight meditation) and metta (lovingkindness) which encourages those who practice to "seek pardon from all those who I have hurt in action, speech or thought." He also claimed the title of the album came to him while meditating. Make Believe marks a return to Cuomo's more personal songwriting style after taking a more distant approach on the previous two albums. "The Other Way" was written for Rivers' ex-girlfriend Jennifer Chiba after her then-boyfriend, singer-songwriter Elliott Smith, committed suicide. Cuomo said, "I wanted to console her, but I was confused and skeptical about my own motives for wanting to do so, so I wrote that song about that." "We Are All on Drugs" was inspired by Cuomo hearing party-goers on Sunset Strip. "Hold Me" was written during a songwriting experiment in which Cuomo fasted for 24 hours and then wrote a song. In addition, early during the recording process, Rubin told Rivers Cuomo to "write a Billy Joel or Elton John type of song." The result of Rubin's request was "Haunt You Every Day", which was the first that Rivers wrote entirely on piano. According to Cuomo, Rubin told Tom Petty the same thing and he wrote "It's Good To Be King." As the band was working on the album, a deal was struck to have "My Best Friend" be included in the film Shrek 2, but this deal was scrapped when the makers of the film didn't think it fit to the timings of the visuals. The Counting Crows song "Accidentally in Love" took the place of "My Best Friend." However, in late 2010, "My Best Friend" was included on the soundtrack to the film "Yogi Bear", and can be heard during the end credits. Hundreds of songs were demoed during the three-year period of making of the album. Despite the abundance of releasable material, this album did not feature any B-side releases. Of the notable unreleased material, partial rough versions of "You're the One" and "Love Is the Answer" can be heard on the "Making of Make Believe" special feature on the disc's Enhanced CD feature. A cover of Toni Braxton's "Un-Break My Heart" was in consideration for the album and later for a soundtrack, although it would only see release five years later on the Death to False Metal album. Six other Make Believe era outtakes, including three which were contenders for the final album, would also see release on Death to False Metal. While deciding on the name of the album, one of the title suggestions given by Patrick Wilson was One Thousand Soviet Children Marching Towards the Sun. Another suggestion was Either Way I'm Fine (something Cuomo said often during the sessions when discussing changing elements of a song or sound). Ultimately the title of Make Believe won over these suggestions. Make Believe is the longest album the band has released to date with a length of 45 minutes. Much of the album's art direction was handled by Francesca Restrepo with photography from Karl Koch and Sean Murphy. The album cover was done in a similar manner to both the band's debut album, The Blue Album and the band's 2001 album, The Green Album. It featured Patrick Wilson, Rivers Cuomo, Scott Shriner, and Brian Bell standing left-to-right in front of a black backdrop with illustrations by Carson Ellis. I here abjure, and, when I have required some heavenly music, which even now I do, To work mine end upon their senses that This airy charm is for, I'll break my staff, Bury it certain fathoms in the earth, And deeper than did ever plummet sound I'll drown my book. The album debuted on the Billboard 200 albums chart at number two, selling 193,000 copies its first week. By April 2006, the album had sold over 1,125,000 copies. To date, it remains Weezer's highest ranked album on the chart. According to Metacritic, Make Believe has received mixed reviews, with a score of 52 out of 100, based on 25 reviews. Some publications like AllMusic and Rolling Stone gave it high remarks, like comparing the album to the band's earlier release Pinkerton in terms of its songwriting, sound, and initial critical reaction. However, AllMusic changed its rating for this album from 4 stars to 3 stars years later. Other reviewers panned the album, like Pitchfork's stark 0.4 out of 10, where reviewer Rob Mitchum stated, "Sometimes an album is just awful. Make Believe is one of those albums." Adam Downer of Sputnikmusic gave the album a 1.5 out of 5, saying "... the album is a whirlwind of mediocrity and self deprecating lyrics." Slant Magazine gave the album 2.5 out 5 stars, saying "The truth is that any Weezer copycat band could have made this record. Our protagonist, Rivers Cuomo, is once again subtly self-deprecating and slightly defeated, but his power-chord-laden pop lacks the conviction of The Blue Album, Pinkerton, and, to a lesser extent, even The Green Album and Maladroit." IGN, however, gave it a 9.3 out of 10, declaring "The Weezer you've been missing is back. ", calling it the band's third great album. All tracks written by Rivers Cuomo. 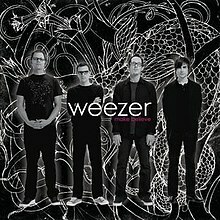 The UK and Japan versions of the album came with two additional bonus tracks, live versions of "Butterfly" and "Island in the Sun" which originally appeared on Pinkerton and Weezer (2001), respectively. The Japanese version also featured a live version of the song "Burndt Jamb", which appeared on Maladroit. The wrong version of "We Are All on Drugs" appears on the first CD release and all vinyl releases of Make Believe. It was later replaced with the correct version on subsequent CD releases. The two versions of the song are sonically identical, but two lines of lyrics are different. The incorrect lyrics contained on the first CD release and the vinyl releases are: "I want to confiscate your drugs. I don't think I can get enough." whereas the correct lyrics on subsequent CD releases are "I want to reach a higher plane. Where things will never be the same." So, early on, a second version of the album was issued with the 'Drugs' and 'Pity' corrected. It's not known if any of the original copies were returned and destroyed at that point. There's likely plenty of both of these first two versions out there, as "Make Believe" sold half a million copies in a matter of weeks (and is currently well over 1 million sold). But then, when it came time for a 3rd single, the band made some changes to "Perfect Situation", changing the "whoa oh" melody and adding the "Perfect Situation" background vocals near the end of the song. This became known as the 'single version' or the 'video version', but the band decided it was better than the original and wanted all further pressings of the album to have this new version instead. So, therefore, a 3rd version of the album was made, and that's the version that's currently on iTunes and in stores (unless they still have very old stock of the CD). ^ Sheffield, Rob (19 May 2005). "Weezer Make Believe Album Review". Rolling Stone. Archived from the original on 14 October 2014. Retrieved 10 April 2016. ^ a b c Erlewine, Stephen Thomas. "Make Believe – Weezer". AllMusic. Retrieved May 29, 2013. ^ a b Grigoriadis, Vanessa. "Weezer's Weird World". Rolling Stone. Retrieved 2007-09-05. ^ a b "Weezer discography: Make Believe: Track By Track". Weezer.com. Archived from the original on 2007-10-11. Retrieved 2007-05-07. ^ a b Sullivan, Kate. "I, Songwriter". Los Angeles Weekly. Retrieved 2007-09-05. ^ "Shrek 2". IMDB. Retrieved 2007-09-05. ^ "The Weezer recording history: Page 15". Weezer.com. Archived from the original on 2006-04-24. Retrieved 2007-09-05. ^ "Weezer - Make Believe - Discogs". discogs. Retrieved 2008-03-12. ^ Rafaello, David. "musicOMH.com - Music - Reviews - Albums - Weezer - Make Believe". musicOMH.com. Retrieved 2008-03-12. ^ "The Tempest, Act V, Scene I". About.com. Retrieved 2008-03-12. ^ "Weezer Tease Fans With Shakespeare Split Riddle". NME. Retrieved 2008-03-12. ^ a b "Reviews for Make Believe by Weezer". Metacritic. Retrieved September 5, 2007. ^ Norris, Chris (July 2005). "Weezer: Make Believe". Blender (38): 122. Archived from the original on December 28, 2008. Retrieved July 6, 2016. ^ Browne, David (May 9, 2005). "Make Believe". Entertainment Weekly. Retrieved May 29, 2013. ^ Simpson, Dave (May 11, 2005). "Weezer, Make Believe". The Guardian. London. Retrieved May 29, 2013. ^ Lecaro, Lina (May 8, 2005). "A heartbeat of uneven rhythm". Los Angeles Times. Retrieved May 29, 2013. ^ "Weezer: Make Believe". Mojo (140): 106. July 2005. ^ Winwood, Ian (May 5, 2005). "Weezer : Make Believe". NME. Archived from the original on March 3, 2016. Retrieved May 29, 2013. ^ a b Mitchum, Rob (May 8, 2005). "Weezer: Make Believe". Pitchfork. Retrieved September 5, 2007. ^ "Weezer: Make Believe". Q (227): 116. June 2005. ^ a b Sheffield, Rob (May 19, 2005). "Make Believe". Rolling Stone. Retrieved May 29, 2013. ^ Inc, Nielsen Business Media (2005-05-28). Billboard. Nielsen Business Media, Inc.
^ Kohli, Rohan (April 21, 2006). "Soundscan Results: Week Ending April 16th, 2006". absolutepunk.net. Retrieved February 12, 2016. ^ Downer, Adam (November 6, 2005). "Weezer - Make Believe Review". Sputnikmusic. Archived from the original on August 14, 2009. Retrieved August 14, 2009. ^ Cinquemani, Sal (May 10, 2005). "Weezer: Make Believe". Slant Magazine. Retrieved May 29, 2013. ^ "Weezer - Make Believe". IGN. 2005-05-09. Retrieved 2013-05-29. ^ Koch, Karl. "06/22/07 Blantons, Crampons, Shunts, Crunts 'n Pundits". Weezer.com. Retrieved 2007-09-05. ^ "Austriancharts.at – Weezer – Make Believe" (in German). Hung Medien. Retrieved 5 December 2014. ^ "Australiancharts.com – Weezer – Make Believe". Hung Medien. Retrieved 5 December 2014. ^ "Ultratop.be – Weezer – Make Believe" (in Dutch). Hung Medien. Retrieved 5 December 2014. ^ "Ultratop.be – Weezer – Make Believe" (in French). Hung Medien. Retrieved 5 December 2014. ^ "Weezer Chart History (Canadian Albums)". Billboard. Retrieved 5 December 2014. ^ "Dutchcharts.nl – Weezer – Make Believe" (in Dutch). Hung Medien. Retrieved 5 December 2014. ^ "Weezer: Make Believe" (in Finnish). Musiikkituottajat – IFPI Finland. Retrieved 5 December 2014. ^ "Lescharts.com – Weezer – Make Believe". Hung Medien. Retrieved 5 December 2014. ^ "Officialcharts.de – Weezer – Make Believe". GfK Entertainment Charts. Retrieved 5 December 2014. ^ "GFK Chart-Track Albums: Week 19, 2005". Chart-Track. IRMA. Retrieved 5 December 2014. ^ "Charts.org.nz – Weezer – Make Believe". Hung Medien. Retrieved 5 December 2014. ^ "Norwegiancharts.com – Weezer – Make Believe". Hung Medien. Retrieved 5 December 2014. ^ "Spanishcharts.com – Weezer – Make Believe". Hung Medien. Retrieved 5 December 2014. ^ "Swedishcharts.com – Weezer – Make Believe". Hung Medien. Retrieved 5 December 2014. ^ "Swisscharts.com – Weezer – Make Believe". Hung Medien. Retrieved 5 December 2014. ^ "Weezer | Artist | Official Charts". UK Albums Chart. Retrieved 5 December 2014. ^ "Weezer Chart History (Billboard 200)". Billboard. Retrieved 5 December 2014. ^ a b c "Weezer Artist Chart History". Billboard. Retrieved 2007-11-27. ^ "UK Top 40 Singles Chart". Everyhit.com. Retrieved 2007-11-27. ^ "New Zealand album chart archives". charts.org.nz. Retrieved 2007-11-27. ^ "Australian Charts". australian-charts.com. Retrieved 2007-11-27. ^ "Canadian album certifications – Weezer – Make Believe". Music Canada. ^ "American album certifications – Weezer – Make Believe". Recording Industry Association of America. If necessary, click Advanced, then click Format, then select Album, then click SEARCH.